On Friday I made my signature pork ribs for our good friend Bob Ward (along with Kimberly’s truffled cauliflower mash and caramelized broccoli) and I promised to blog the ribs recipe. I’ve been making ribs like this for about ten years – they’re dry and you have to tear the meat off the ribs with your teeth, rather than the usual American ribs where the meat falls off on its own. I don’t remember which BBQ recipe book I originally got the recipe from but it’s evolved over the years into what’s below. Let me know if you try it – enjoy! Prepare the ribs: wash the rack and cut it into individual ribs. Arrange in a deep rectangular dish (e.g. Pyrex or Le Creuset) on their side – layed out like ( ( ( ( (. Optional: discard weird-shaped or extra pieces of meat. Prepare the sauce: pour the soy sauce into a Pyrex measuring jug. Pour the sherry in too. Pour the honey into the mixture. It’ll settle at the bottom of the jug. Peel the garlic (vary the amount based on your garlic-loving preference) and use a garlic press (I use this one) to get the ‘meat’ of each garlic glove into the sauce jug. Discard the skin of each garlic glove. Marinate the ribs: Mix up the sauce with a small fork to get the honey mixed in. Pour the sauce evenly over the ribs. Cover the rib dish with cling wrap and let it sit in the fridge for 4-24 hours. Prepare to cook: set the oven to broil and set the top oven shelf to be one level down from the very top. Line a deep rectangular baking/broiling pan with aluminum foil. Arrange the ribs on the side on the foil in two rows like ( ( ( ( (. Broil: broil the ribs as prepared for 5 minutes. Remove from the oven and turn the ribs over in place. Drizzle the remains of the sauce and garlic over each rib using a small spoon. Broil for 4 more minutes. Remove from the oven. Bake: after broiling the ribs the second time, set the same over to bake at 325F. Turn the ribs a second time and drizzle any remaining sauce on them. Bake on the bottom shelf for 20 minutes. Increase heat to 350F and bake for 10 more minutes. Increase heat to 375F and bake for 10 more minutes. You want the outside of the ribs to be blackening and caramelizing. Remove and place in a serving dish. Eat immediately with your hands. For garlic lovers, get a teaspoon and scoop the concentrated garlic mush and sauce from the bottom of the baking pan – yummmmm! Extra ribs can be eaten cold over the next few days or reheated by baking for 5-8 minutes at 375. This is a quick post to let you know about a bug that a few people are hitting when running DBCC CHECKDB. 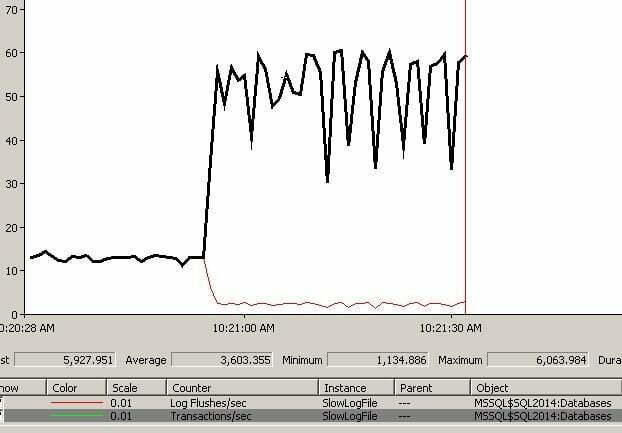 The symptoms are a series of errors in the error log plus SQL Server forcibly shuts itself down and restarts. I’ve heard of people hitting the bug on SQL Server 2014 and SQL Server 2012 SP1. [Update 2/24/15] Microsoft has confirmed that it’s a bug in 2014 and 2012 and they’re planning a fix for the next CU of both. [Update 3/18/15] The fix for SQL Server 2012 is in CU5 of SP2 and is described in KB 3044958. 2014-11-18 09:04:15.69 spid64      The operating system returned error 665(The requested operation could not be completed due to a file system limitation) to SQL Server during a write at offset 0x00001EE6FD8000 in file 'C:\SQLskills\\Company_file2.ndf:MSSQL_DBCC23'. Additional messages in the SQL Server error log and system event log may provide more detail. This is a severe system-level error condition that threatens database integrity and must be corrected immediately. Complete a full database consistency check (DBCC CHECKDB). This error can be caused by many factors; for more information, see SQL Server Books Online. 2014-11-18 09:04:15.72 spid64      Error: 3314, Severity: 17, State: 3. 2014-11-18 09:04:15.72 spid64      During undoing of a logged operation in database 'Company', an error occurred at log record ID (887654:3321:14). Typically, the specific failure is logged previously as an error in the Windows Event Log service. Restore the database or file from a backup, or repair the database. 2014-11-18 09:04:34.38 spid64      Error: 831, Severity: 20, State: 1. 2014-11-18 09:04:34.38 spid64      Unable to deallocate a kept page. 2014-11-18 09:04:34.40 spid64      Error: 3449, Severity: 21, State: 1. 2014-11-18 09:04:34.40 spid64      SQL Server must shut down in order to recover a database (database ID 23). The database is either a user database that could not be shut down or a system database. Restart SQL Server. If the database fails to recover after another startup, repair or restore the database. The 665 error is from the snapshot file that DBCC CHECKDB creates hitting an NTFS limitation on the number of file fragments in a sparse file. This causes the snapshot creation to fail. The failure causes the undo of a log record in the snapshot to fail (remember that a database snapshot undergoes crash recovery to make it transactionally consistent). This failure then leads to SQL Server thinking it has to forcibly restart to recover the snapshot database, which is should never do for a snapshot – and that’s the bug. I’ll update this post as soon as I hear about the builds that the fix is in.